In March 2003, as the Iraq war loomed, people in Erbil were concerned that the war might extend to the city. Many were preparing to leave their homes. Nawzad Tayib was one of the thousands that fled the city a few days before the start of the war. Tayib, 58, fled to Koya, a small town one hour southeast of the city. "When people heard news about the coming war, they were afraid of possible chemical attacks from Saddam," Tayib said. "People were afraid of the war and its aftermath." A few weeks before the war, U.S. troops deployed to Kuwait, and United Nations inspectors retreated from Iraq. U.S. commandos even parachuted into a military airport near Erbil, Tayib said. "We left Erbil in order to find a safer place for my family, a place to escape clashes," Tayib said. He fled with his wife and six children; the youngest one was 14 at that time. "We were at my sister's house, there were already five people but their house was large enough for 13 people to live in," Tayib said. "We shared everything but it still feels bad to live in a house which is not yours and disturb others." Tayib's fourth son, Muhammad Nawzad, was 15 then. "I became sick during the war and my father brought me to Erbil to the doctor, we heard sounds of artilleries and planes," Nawzad remembers. Most people chose villages and small towns to stay in during the first weeks of the war. "People thought that if there were to be an attack, it would be on large cities since there could be more victims and huge damage," he said. But the Iraqi army bombed places across Kurdistan during the war. "That made people aware and take the warnings seriously," his father said. "We were watching news TV channels all day during the war. Some channels broadcasted live from Baghdad while it was being bombed by coalition forces." Nawzad remembers the bombing's impact on that year's Newroz, the holiday Kurds celebrate the first day of spring, the Kurdish New Year. "It was the first Newroz in my life that we couldn't celebrate," he said, because they were still in hiding. "But the first rockets falling on Baghdad were equal to 100 Newrozes for me. It was a stunning day." After the fall of Baghdad on April 9, 2003, people who left their homes before and during the war returned. 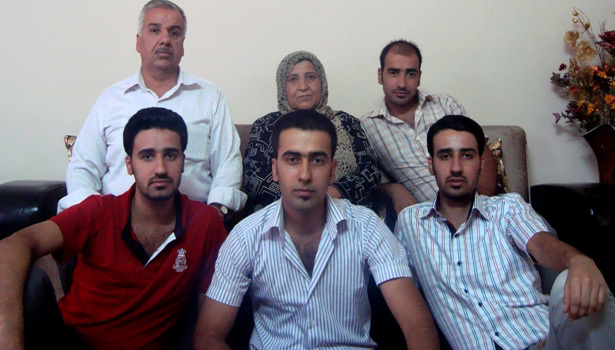 Nawzad and his family returned to Erbil one day later, three weeks after they fled. "When we came back we realized that all our close neighbors had fled except one family who was unable because they had a couple of handicapped children, but then all of them came back," Nawzad said. "Everything in the house was in its place, nothing changed, and nothing was stolen." Tayib remembers that day well. "People were very happy with Saddam's downfall. It was a great day, because he was a dictator and a criminal. People were looking forward to live in stability and peace."